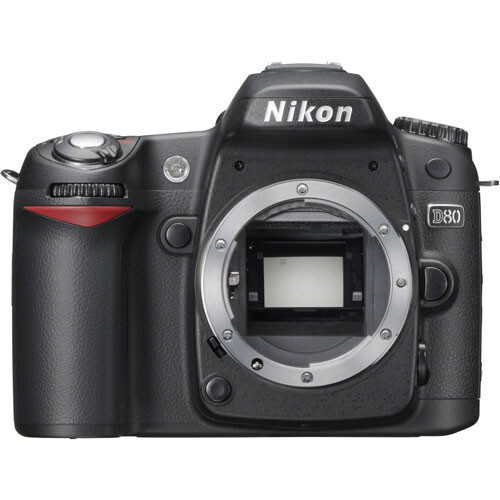 The Nikon D80 SLR Digital Camera features a 10.2 effective megapixel DX Format CCD image sensor, providing a high level of resolution and sharp detail, so users can have the freedom to crop creatively and print impressive enlargements. It features Nikon's high-resolution image processing engine and a dedicated high-performance processing chip that has been introduced to significantly accelerate performance on all levels. With a start up time of just 0.18 seconds and a shutter release lag time of approx. 80 milliseconds, the D80 delivers instant response, and provides continuous shooting at a rapid 3 frames per second, making action photography a reality and the camera a must have for photography enthusiasts. Packing high performance and high resolution into a slimmer, more compact body, the D80 also remains true to Nikon's commitment to intuitive operation. The size, layout and operation of all controls are designed for maximum ease of use. A large, bright viewfinder with large 0.94x magnification ensures the clearest view possible and a large 2.5-inch, 230,000-dot high-resolution LCD provides an ultra-wide 170-degree viewing angle from all directions. A RGB histogram display also assists when evaluating exposures with greater precision. And a user-friendly menu interface makes for easier operation and menus can be customized using the "My Menu" setting. Furthermore, exclusive in-camera image editing features, such as D-Lighting and Red-eye correction ensure consistently satisfying results and greater creative freedom without the use of a computer. Effectively optimized by Nikon to deliver a wide dynamic range, the DX format CCD produces outstanding images with high resolution and vivid detail, yielding 3872x2592-pixel files. The industry-leading 12-bit advanced imaging processing engine of the Nikon D80 provides color-independent pre-conditioning prior to A/D conversion and works in harmony with high-precision digital image processing algorithms to produce natural-looking images that benefit from faithful color and tone reproduction. With a near instant power-up time of 0.18 seconds and a mere 80-millisecond shutter time lag, The Nikon D80 promotes fast handling and enables photographers respond to any photographic opportunities as they arise. Additionally, swift continuous shooting performance at 3 frames per second enables the shooting of up to 100 JPEG (FINE M-size or smaller) or up to 6 RAW (NEF) images, and shutter speeds ranging from 1/4000 to 30 seconds or bulb setting provide full creative control. Nikon's Multi-CAM 1000 AF System provides maximum flexibility and optimum performance under varied shooting situations. The 11-area autofocus system features a cross-type sensor in the center, broad frame coverage, as well as class-leading low light detection and convenient AF-assist illuminator to aid in low-light conditions. The Wide Area AF option gives greater compositional freedom when shooting sports and action. Substantially more sophisticated than traditional multi-pattern metering systems, Nikon's 3D Color Matrix Metering II instantly and accurately evaluates brightness, color, contrast, selected focus area and subject-to-camera distance information, referencing the results against an onboard database of 30,000 scenes from actual photography. Vary the size of the center-weighted area reading and spot metering readings correspond to 11 focusing points. The D80 has seven automated Digital Vari-Programs that are easily accessed from the Mode Dial, and provide automatic operation optimizing white balance, sharpening, tone, color, saturation and hue for crisp and vivid results that match the intended shot. Selections include Auto, Portrait, Landscape, Close Up, Sports, Night Landscape and Night Portrait. Furthermore, easily accessed image optimization options closely tailor results to the scene at hand or the intended use of the image, including user selectable image sharpening, tone (contrast) compensation, color mode, saturation and hue adjustment. Playback images can be viewed easily from all angles with extraordinary color and clarity on the large 2.5-inch LCD monitor with a 170° viewing angle and a dedicated zoom button to assist with accurate and easy assessment of sharpness by enabling image preview up to 25 times magnification. Convenient displays include RGB information as a single histogram display or as separate histograms for each color channel. The carefully chosen color scheme and increased font size of the color-coded menu display makes navigation easier on the eye, easier to understand and easier to use, while "My Menu" lets you customize Menus to display only the items you wish to see. Creative in-camera effects and editing functions are available under the Retouch menu, and provide greater creative freedom without the need of a computer. Nikon D-lighting automatically brings out detail to enhance results and add creative flair, all the while optimizing overall exposure balance. Red-eye Correction automatically detects and compensates for the annoying red-eye effect sometimes caused by flash. Image Trimming can be used to produce smaller files for easy sharing or greater efficiency for specific end purposes. Image Overlay merges a pair of selected RAW (NEF) files taken with the D80 to create a composite image that can be saved in RAW or JPEG format. Monochrome Black and White, Sepia and Cyanotype along with Skylight, Warm Tone and Custom Color filter effects. Multiple Exposure creates a single image within the camera from up to 3 consecutive exposures to produce imaginative and even surreal results. The High-Efficiency power system provides superb battery life. As a result, the Nikon EN-EL3e Lithium Ion rechargeable battery delivers enough power to support the shooting of up to 2700 images on a single charge (fully charged battery @ 20°C/68°F). It can be recharged at any time and supports the handy real-time fuel gauge system display on the D80 Camera that shows remaining charge by percentage, number of shots since last charge and overall battery status. PictureProject software is included with the Nikon D80 and features an intuitive user interface that provides fast and easy access to powerful tools for organizing, editing and sharing images. Auto Enhance and other creative functions are readily available via handy buttons, as are Mail, Slideshow and CD/DVD burning functions. Pictures can be organized using simple drag-and-drop operation, and can be quickly located by name, keyword, or date. Even design templates that make it easy to produce prints, tailor images to e-mail, or layout several images on a page to produce creative album layouts. The optional Capture NX software is Nikon's highly versatile and elegantly simple photo editing solution designed to help photographers tap the full potential of NEF (RAW) images. Featuring an innovative user interface that provides easier access to powerful and visually intuitive enhancement tools, Capture NX's powerful photo image processing and editing tools can also be applied to JPEG and TIFF files to satisfy a broader range of photofinishing needs and applications. D80 SLR Digital Camera (Camera Body) is rated 4.7 out of 5 by 214. Rated 5 out of 5 by That Camera Guy from Amazing!!! I use this camera as my primary in wedding photography. It is light, easy to use, and has most of the useful features found in the much more expensive D200 and D300. Spend your money on your glass and not your body. For the same price as a D300 you can get a D80 and a Nikon 17-55mm F/2.8. This combo will give you sharper, more vivid, and more professional pictures than a D300 with a kit lens. The glass is also 10 times faster and way more sensitive for low light. Your glass is a lifetime investment while your body is good for a couple of years tops. The D80 is a great buy whether you are an enthusiast or you make your living with it. Rated 5 out of 5 by Ferrari250GTO from By far the best camera for the money I bought the D80 rather than the D40 or D60 because I don't have to go into the menu to adjust everything. The Canon Rebel series had bad ergonomics, and didn't feel well made. The 30D and 40D felt too big. The D80 felt just right. It has absoulutely fantastic image quality. It has ample speed, unless of course you are doing sports photography professionally. It has excellent ergonomics, so good that I can almost adjust things by feel. It may not have the magnesium body of the D200 and higher, but it feels very well made. All the custom settings that you need are in this camera. I can imagine having this camera for a long time. It is absolutely fantastic. Rated 4 out of 5 by Photography by Valentino from Great value in a sturdy camera This is a good, sturdy, camera body. If you are a Nikon owner, the learning curve is not as steep. Many of the controls are intuitive or can be discovered with minimum manipulation. It is great to be able to change ISO ratings as it is like having a choice of several rolls of film. However, the N80 does NOT approach the dynamic range of film. Subjects in the shade will be properly exposed while the blue lake and sky in the background will become a stark white. It is important that you buy your N80 from an authorized Nikon dealer. Many features on the Nikon site and software improvements are not available to grey market purchasers. Rated 5 out of 5 by dalewai from Pro Quality - Consumer Price The D80 is a pleasant surprise. The D80 has made my transition from film and point and shoot digital a rewarding experience. I have friends with more expensive Canons and Nikons, but I can't tell the difference in performance. Albeit, I take pictures of my children's birthday parties and sporting events. But that's the extent to my camera use. The flash gives even lighting which makes the pictures appear more natural and the programmed shooting modes make taking pictures enjoyable. The construction is light and sturdy, better the Canon at similar price. I know there's more expensive models, but the D80 is all I need. Highly Recommended. Rated 5 out of 5 by Anonymous from What a pleasure to use! I recently upgraded to the D80 from the D40. This is a fantastic camera. It feels good in my hands, as it has some weight to it but is not too heavy. The construction feels solid. All the controls (aperature, shutter, even iso, w/b, flash comp) are right at my fingertips and simple to change. I love that I don't have to dig through menus to access all these items. While only skills can make a better photographer, good tools certainly help. This camera will accommodate both the new aspiring photographer to the pro. I expect many years of use and am happy I can use the nifty-fifty with auto focus and many other non-motorized lenses with this camera. Rated 5 out of 5 by DestroyerTSA from Awesome Camera This is my primary camera. For the price you can't beat the build quality and options. 10.3 will do most everyone well. With the incredible number of lenses available at all different price ranges this is a platform that you can ease into financialy. With the large number of these cameras out there it makes finding used lenses and selling yours when you upgrade much easier. While the D300 and D3 offer more they do so at a dramatic price increase. You can step into a D80 for $1000 or less and pace yourself. The photos are awesome and all the features you need to either do it yourself or let the camera do it for you are a click away. I use my Cannon G9 as a small frame backup. Rated 5 out of 5 by Afflictedlife from Great Starter Digital I bought this camera as an entry level professional digital. Having no formal training yet, I still found it quite easy to figure out all of the different settings and modes with the help of the manual. the Camera is very well constructed and is capable of some truly beautiful photography. The only thing I wish it had was the ability to take flash-less shots in much lower light (though I may just not have discovered how to do this yet) I will be putting it through its paces next year when I start photo-documenting my travels across America, and it seems like this camera will be able to handle anything I want it to do.